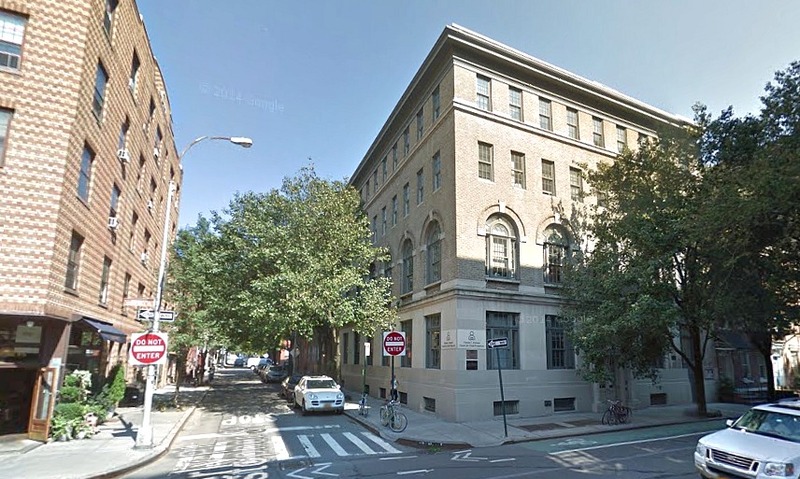 In September 2014, the foster and child-care agency New York Foundling, one of the city’s oldest charities, sold its Greenwich Village building for a staggering $45 million to an unknown buyer with the intention of converting it into a single-family mansion. It will be among the most expensive single-family residences ever purchased in Manhattan. The four-story, limestone and brick property on the northeast corner of Christopher Street and Waverly Place sits within the beloved Greenwich Village Historic District, and currently the owner is seeking approvals from the Landmarks Preservation Commission to add a pergola, mechanical equipment and an elevator bulkhead to the roof. 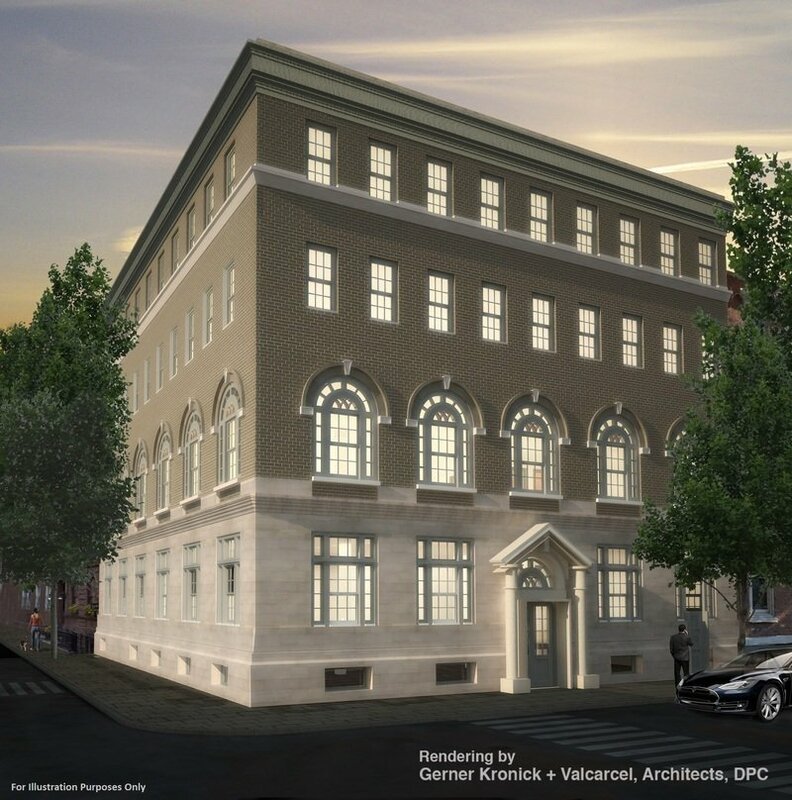 Yet-to-be-approved permits were filed in November by HS Jessup Architecture, detailing a sprawling home of five floors and 15,000 square feet of floor area. Plans on Jessup’s website show the mansion will have six bedrooms, two kitchens, its own elevator, a dressing room and walk-in closet larger than most apartments, a 50-foot lap pool, and more than 4,000 square-feet of outdoor space that will include a rooftop terrace. The architect also handled the neo-traditional penthouse addition atop 345 West 13th Street in the Meatpacking District. Conceptual marketing images prepared by GKV Architects for when the property was on the market. The cellar level will host a recreation room, a 50-foot-long lap pool, storage rooms, a laundry room and staff quarters, and many of the buildings mechanical functions. The ground floor will contain many of the mansion’s living spaces. The entrance is centered along its Christopher Street frontage where there will be a vestibule and an oval-shaped entry hall. 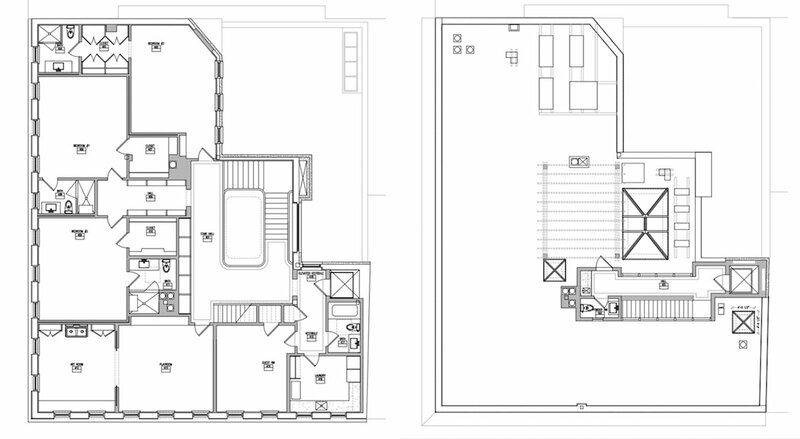 To the left (west) is a sprawling living room that leads into a dining room that will accommodate both a 14-seat dining table and a six-seat dining table. 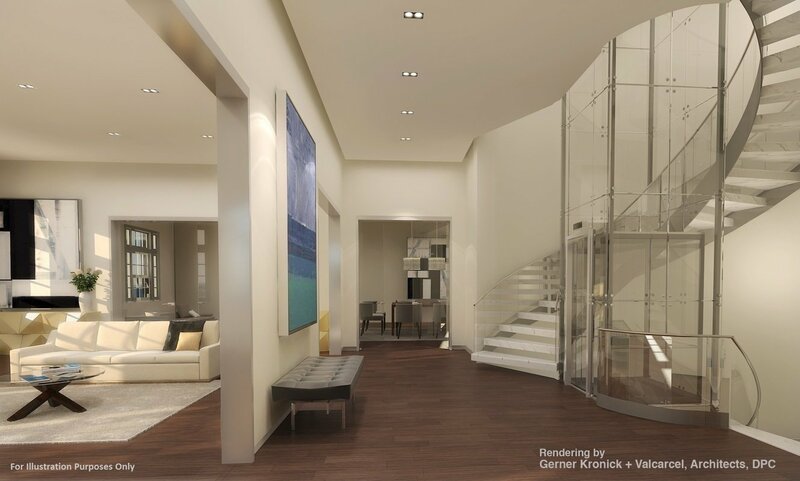 A grand, centrally-located skylit staircase leads to all floors above and below. Along the eastern, less-light bathed side will be a secondary private entrance, a media room, an elevator and an elevator lobby, a staff pantry, butler’s pantry, and storage. The second level will its tall arched windows will have a play area/den, study hall, game room and a family-sized, eat-in kitchen, along with a coffee station and a breakfast room with a six-seat dining table. The breakfast room is provided a set of doors opening the room to a large internal courtyard. 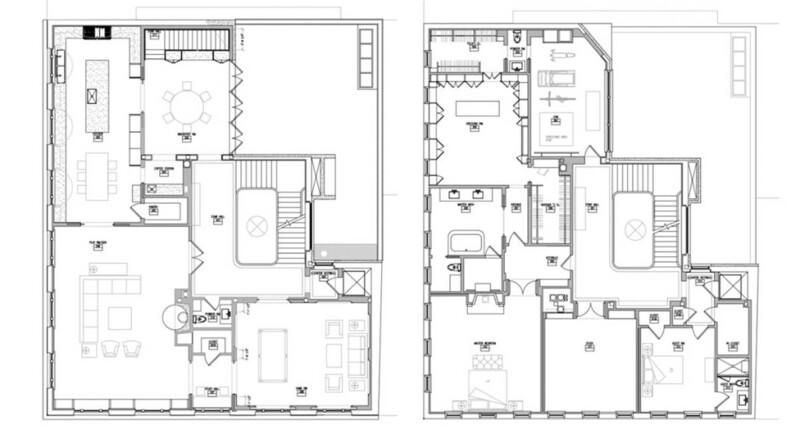 The third level will host the master bedroom, master bath, and an accompanying dressing room and walk-in closet. On this level will also be a fitness center, study and guest room. 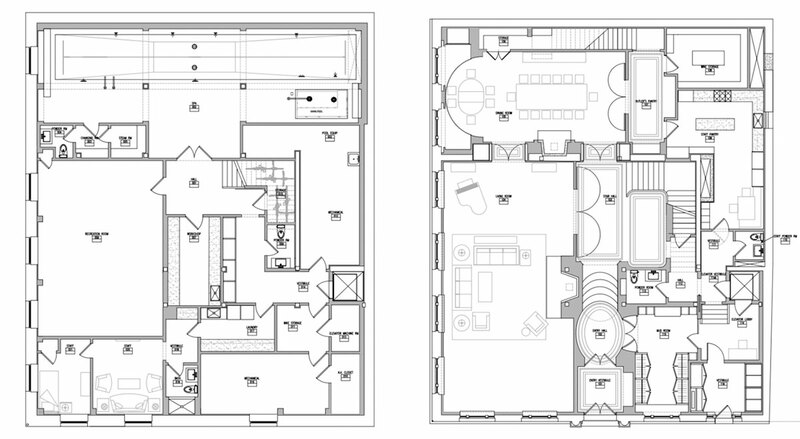 The upper level will host three bedrooms, another guest bedroom, a playroom and laundry. The rooftop will be accessible and likely re-imagined with landscaping. The neo-Classical Building was constructed in 1911 by Irish sisters who owned a dressmaking business. Foundling paid just $3 million for it in 2002 and according to the Daily News will use the deal’s proceeds for new initiatives for older kids who are being transitioned out of foster care. Over the years, it’s also served as a Catholic elementary school and nursing school for St. Vincent’s Hospital. The building is currently operated by the Fontana Center for Child Protection, who will relocate to another Foundling location on Sixth Avenue and 16th Street. Yikes! Someone has too much money and too little brains.